It’s no big deal to become a rock climber really. While rock climbers are generally super cool dudes, they’re not superheroes, not men of super powers. Climbing babysteps are really easy, but it takes an unique blend of personal affinities to push you any further in that kind of adventure. So to say, your strength and your general athletics, are not of any critical importance at the beginning of your climbing career. But safety is! By the time, you can work on your climbing performance all on your own – train and work on techniques and climbing moves – depending on what kind of climbing are you interested in, but you won’t even get the chance to do so if you don’t learn how to stay alive first. And climbing is all about surviving. You have to love and understand the nature. Your awareness of how small a man is when compared to overwhelming forces of mother nature, might and probably will save your life. So, in order to prepare yourself to go rock climbing, you have to know at least something about staying in the wild. Orientation, proper physical shape, knowing first aid, understanding all the subjective and objective problems that might appear – all these are good preconditions for climbing. But then again, these are all just general preconditions for absolutelly any stay outside the commodity of your home. And when it comes to safety in rock climbing specifically, we are then speaking in terms of equipment. Anyone interested in rock climbing must – first of all – know the knots. The knots are what makes climbing possible. Not the man, not the mountain, but the knot. Climbers are dealing with ropes. Not any kind of ropes though, but the ropes specially designed for climbing activities – ascending, belaying, rapelling and yes – falling. To get the ropes do what they are designed to do, climbers are operating with a set of knots, each of which has a specific use and function. But they all serve the same goal – to keep you and your partner safe. Beside the ropes, climber’s equipment includes climbing harness, metal pieces like carabiners, chocks and cams, belaying devices, helmet and climbing shoes. During the climb, all these pieces of equipment and the climbers involved are connected within a system that works well, but only while every part of the system is integrated on the exact purpose. The smallest mistake in setting the system straight, is potentially lethal for everyone included. So, the bottom line on the equipment part is – finishing climbing school and also climbing with experienced climbers before you head on for a climb of your own, is more then advisable. But even when you get all the references available and get to know all there is to know, there is still one more thing you need to keep the climb successfull and safe, and that’s your mind concentration – the focus. 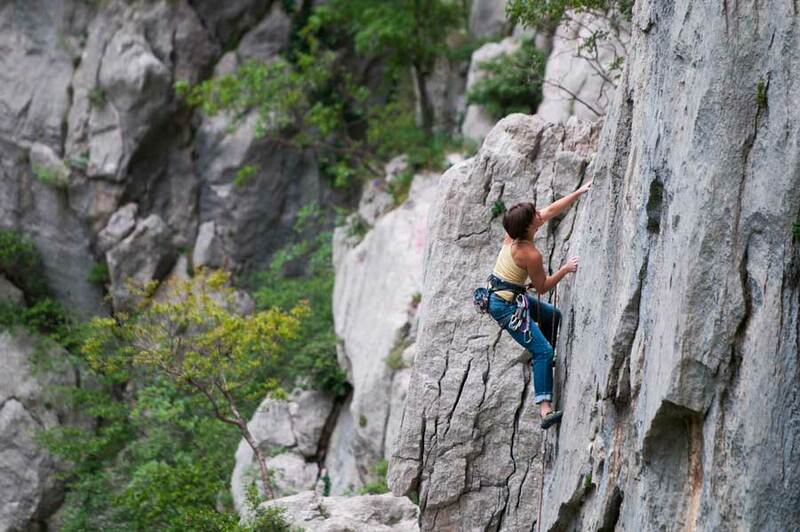 Even the most experienced climbers make mistakes and mistakes are made when we loose focus. People say “everyone can make a mistake”, and that’s cool, but in the world of rock climbing any mistake, even the slightest one, may turn into driving the death road. We don’t intent to scare you or anything, we’ve just been honest and with all this in your mind, rock climbing turns to be just awesome!